October 14th was the seventeenth day of the hunger strike of Palestinian prisoners in Israeli jails. 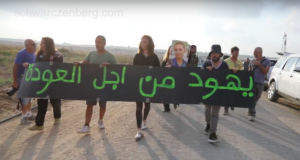 People took to the streets for a solidarity demonstration in the village of Beit Ummar, Hebron. This is the second such demonstration in this village, a similar march last week led to several arrests in a dawn raid on Thursday 13th October. There have been numerous demonstrations across the West Bank since the Palestinian prisoners’ hunger strike began. These are in support of the 9 demands of Palestinian prisoners, which include the right to family visits, end to the use of isolation as a punishment, and an end to the profiteering of Israeli prisons from financial penalties charged against prisoners. 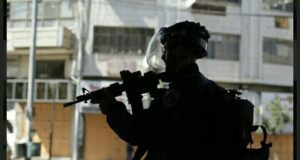 The Beit Ummar protest began after noon prayers with a peaceful march through the village, but later there were clashes between approximately 10 – 15 young demonstrators and the Israeli military, who used tear gas to disperse them. The clashes continued until around 4pm. Nobody was seriously hurt. 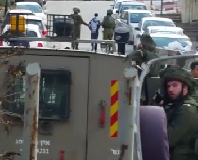 Later that evening – after the press and international observers had left – Israeli forces closed all main entrances to the village. These have yet to be re-opened. Popular Committee spokesman, Muhammed Awad, reported that an ambulance was prevented from passing through. It was en route to attend to a sick man, but the Israeli forces refused access despite protestations from the ambulance crew. The mayor of Beit Ummar, Nasri Sabarneh, has condemned the action, calling it revenge for the hunger strike solidarity marches. The names of three men arrested following last weeks protest are Yousef Ekhil, 40; Muhamad Bahar, 17 and Ahmad Sleibi, 16.